If you haven't heard of Shiritsu Ebisu Chuugaku, then quite obviously we have been living under the same rock, because I didn't hear of them until a little while ago... like, a month or two ago to be exact. 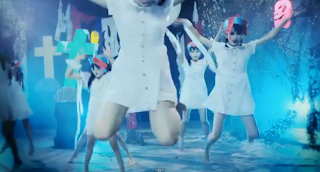 And I may get eaten alive for saying this, but all of these girls are at least 5x cuter than the members of MomoClo. That's just my opinion, kay? Anyways, today I am reviewing the first song that I ever came across, thanks to a friend, that Ebichu had produced, and it's quite a coincidence that I decided to review it in October, the month of Halloween. 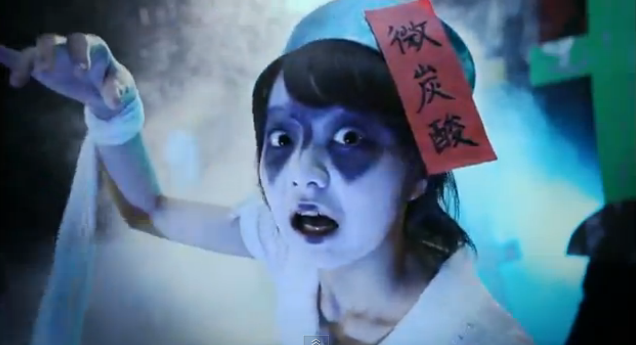 Yep, it's that crazy Halloween-esque looking video Oh My Ghost? ~Watashi ga Akuryou ni Natte mo~. So, as I said previously, this was the first song that I listened to by Ebichu, and though I never really wanted to care for the group, I found myself coming back to the song and the video. Why? Because it's extremely bloody catchy and the girls are too cute for words. It's also nice to see the amount of effort put into the video, dance and how the girls look. It's a nice contrast from Morning Musume's simplistic PVs, even though I do love them. 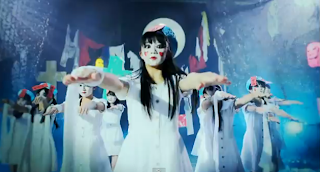 But one of my immediate reactions to the video was that it seriously reminded me of Momoiro Clover, and the girls all reminded me of MomoClo too as well as their singing voices. 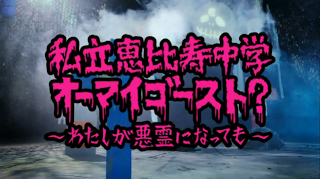 Even the structure of the song is just like Momoiro Clover. Talking, singing-talking and a really childish, catchy beat. 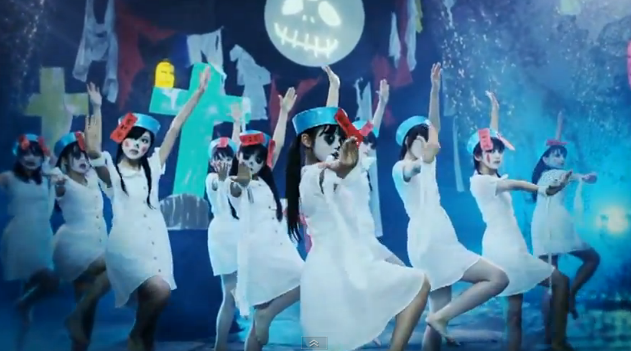 It all reminds me of MomoClo, but that isn't really a bad thing. 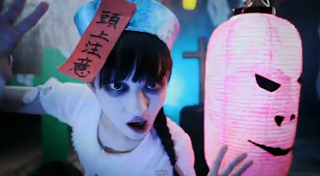 So, the video opens with some acting by two of the girls, and a strangely familiar moon in the air. Hi, Jack Skeleton! 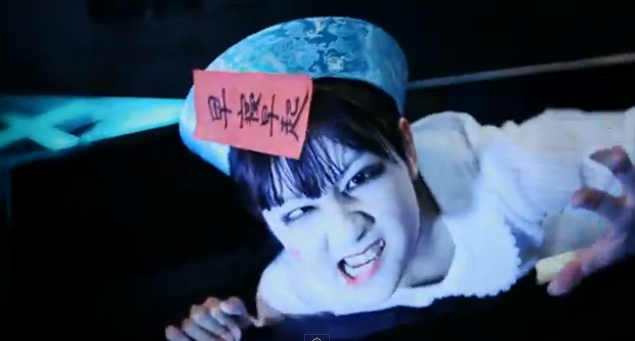 Anyway, the beginning of the video doesn't portray the best acting, but who cares? These two girls are cute, and it makes me lol a little when I listen to pigtails scream whilst looking the least bit scared. I also love the Wolf mask and the fact that Wolfy isn't ripping her friend to shreds when pigtails is just screaming to our faces. Okay, can I have one of each? 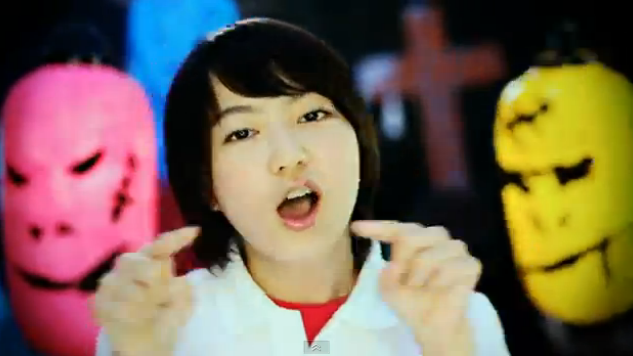 OMFG It's Tekeuchi Akari 2.0! This ones my favourite <3 How could you resist that smile? Oh lord, this scene XD My first ever reaction was 'WTF?' but I think it fits with the song - it's meant to be Halloweeny, but it isn't meant to be totally serious. I mean, what Zombie-Nurse looks like that? Luckily, it adds an element of humour in the video, but in a way it can be a bit freaky and weird if you think about it. I mean, come on! They look like mimes, and mimes can be just as scary as clowns in my opinion! 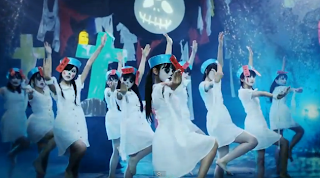 I think that they brought this scene in at a perfect time during the video; it isn't too early, and the way they act when dancing during the instrumental makes the costumes and the way they look (a little gormless) fit in with the zombie-like dance. 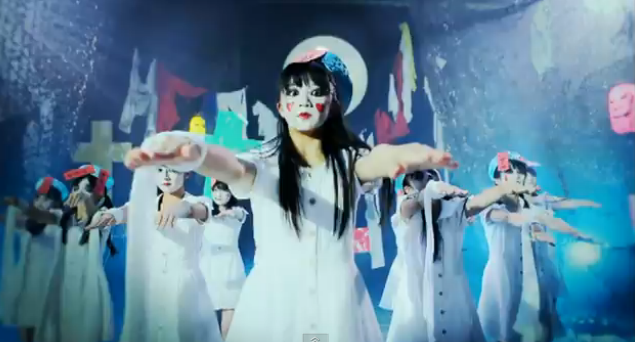 However, I do think that the make-up is a bit ridiculous, but then I remember that this is a sister group to MomoClo - there is no limit to how ridiculous the PV can be, so I forgive them for that, and applaud them for actually stepping out and playing around with the video, the costumes and the make-up. It makes it stand out and thus makes it so much more appealing. These are also some of my favourite scenes, simply because the girls either look good whilst pulling faces that are meant to be shocked or scared, or just down right cute and funny. But this has to be my favourite, purely because it really fits in with the darkness, and it's something I would expect to happen from a Zombie, like 'Come to the Darkness, I has CANDEH'. Ebichu: "Come Hither, little ones~"
Regarding the song, I really think that it is a fun and catchy tune. I recently seem to have it stuck in my head, and it's a song that I remember quite quickly too. When I think of the songs name, I remember the tune, and that honestly doesn't really happen for me, so yeah... this song is memorable I guess. What I love about the song itself is that it is really fun and quirky, and changes pace so frequently throughout the song. It goes from happy and carefree to shaky and scared, with deep, lower voices thrown in as they speak/sing, then goes right back to its fast and lively pace. It's really wonderful to listen to, and makes me feel somewhat energetic. Even though you would initially think that the song would be darker and less energetic because of its theme (ghosts), it is really surprising and a great song to listen to. Overall, for the first song that I heard from this group, I am already really impressed. I actually recently decided to see what else they had sung, and this is their last Indies single. I'm surprised that this is an Indies single, for one, because it is extremely well made and well thought out. It's also on the same level of craziness that MomoClo is, but I guess the producers really do care for the girls and for their debut, so they made an effort. As far as I know, only one of their other indies songs has a PV, but it's a pretty simple dance-shot/close-up shot affair from what I saw of it when I flicked through the actual video. So, I really like this group. I am surprised that they have only just debuted as a full-fledged Idol group, but I really hope that they take Japan by storm with their cuteness and the energy that they have. I would love for these girls to become well-known, popular idols like their big sister group, MomoClo, and I would love it if they kept bringing out cute and lively songs. 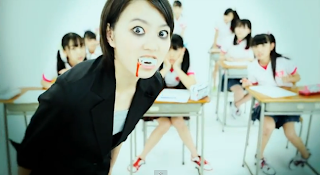 I really like this song and the video - initially, after first seeing it, I didn't care. I wasn't too keen on MomoClo at that point, but I've really started to like Ebichu The song kept popping up enough for me to start acknowledging it and then liking it. These girls are super adorable, and I love this song~ I also really like their newest single, Motto Hashire!, which is their debut. Please check that one out! If you like MomoClo, then you will like this! 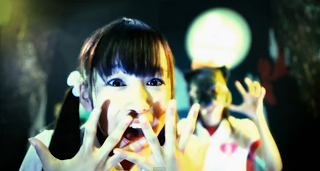 But even if you aren't keen on MomoClo (like I'm not, really), still give this group a chance! Let them cast a spell on you with their cute charms! I don't think they sound particularly like Momoclo but , yes , I think they are a wonderful cute goup , full or energy and personality . Personally I prefer Tissue to Ghost but are equally good in both. Lets hope for an album soon. I think the group is great! They have definitely made me interested in terms of what they are like. I can't wait to hear more from them! And an album would be just great!